Corporate Social Responsibility | Myriad Genetics, Inc.
Empower our employees to become more engaged in the well-being of their own communities. Philanthropy Myriad provides financial support to nonprofit organizations and shares the expertise of Myriad employees in the communities where we operate. Advocacy Myriad collaborates with and supports key patient advocacy and support organizations where we have the ability to make a positive difference in addressing complex health challenges, providing education about diagnostic testing and improving the quality of life for patients. Scholarship Myriad provides financial support for academic scholarship and education at both the undergraduate and post-graduate levels, and contributes to advancing education and training for women and minorities in medicine and science. Patient Assistance Myriad is working to improve overall healthcare quality and increase access to diagnostic testing for uninsured and underinsured populations by offering robust financial assistance and free testing to those in need. 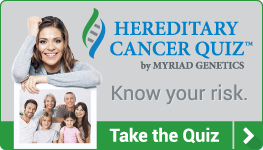 Myriad is proud to sponsor and partner with disease advocacy and patient support groups who provide education, awareness and resources to cancer survivors, previvors, caregivers and others affected by cancer or other major diseases.